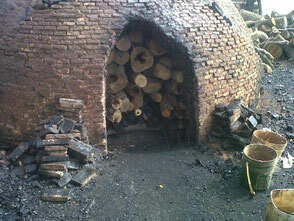 The charcoal is manufactured from the wood of the Quebracho tree in the provinces Santiago del Estero and Chaco. The name Quebracho derives from the Spanish word „quiebrahacha“, meaning „axe-breaker“, which says a lot about its hardness. The tree does not grow in the tropical rainforest but in Gran Chaco, a slightly hilly region with dry forest and tree savanna in the middle of South America, surrounding the north of Argentina, the western part of Paraguay and the southeast of Bolivia. Not only in the furniture industry the quebrachos´ wood is appreciated because of its durability, its hardness and its tannic acainly, it is also being used for building bridges and harbour installations, telephone poles and pasture fences. 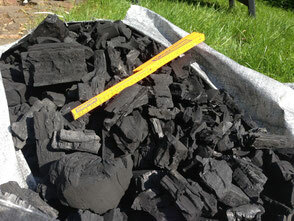 The parts that are not useful for the manufacture of those products are being used for making the charcoal. This hard wood has a weight of 1.2 kg/dm³, giving it a really high energy value, reflecting in a long burning time and high temperatures. The tree itself does not underlie the Washington agreement CITES (Convention on International Trade in Endangered Species). We protect the environment and work with a producer who is registered at SEAM and INFONA. This insures that our charcoal is certified and complies with all nature conversation legislations. Furthermore we guarantee, that the used wood is a 100% byproduct and no trees are cut down for the production of this charcoal. The charcoal is characterized by the following aspects: easy to light, very long lasting, smoke free glowing, strong heat development and a pleasurable grill aroma.